Finely bound for Beriah Botfield by Charles Lewis in 1834, gold-tooled olive morocco over pasteboard, decorated in 'the Grolier style', geometric design, gilt edges, yellow endpapers (watermark dates 1832-33). 5 parts bound in 6 volumes; part 1: 234 leaves; part 2: 300 leaves; part 3: 468 leaves; part 4: 519 leaves, divided after fol. 227; part 5: 330 leaves; a number of ornamental woodcut initial capitals throughout. 1. Joseph Justus Scaliger (1540-1609); cf. 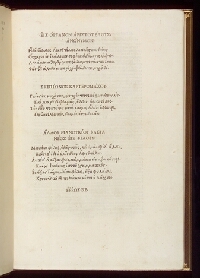 fep 2v: 'Ex bibliotheca viri incomparabilis Josephi Scaligeri, in the hand of Scaliger's close friend, pupil and fellow classicist, Daniel Heinsius (1580/81-1655); auction at Leyden, March 1609, sale catalogue p. 10. 2. Richard Heber (lot 503 in his 10 Aprial 1834 sale at Sotheby's). 3. Beriah Botfield by Payne and Foss for 30 gns when this set was still bound in boards. 4. Sold at Botfield's sale at Christie's (30 March 1994, lot 39).